Bring the kids along to Sky Tower and Auckland Zoo. There's much more to do: get engrossed in the history at Auckland Museum, enjoy the sand and surf at Cheltenham Beach, get your game on at Virtual Reality Studio, and listen to music at SEA LIFE Kelly Tarlton's. To see more things to do, where to stay, ratings, and more tourist information, you can read our Auckland trip planning tool . Manila, Philippines to Auckland is an approximately 14-hour flight. You can also do a combination of bus and flight. You'll lose 4 hours traveling from Manila to Auckland due to the time zone difference. In June, Auckland is much colder than Manila - with highs of 15°C and lows of 15°C. Finish up your sightseeing early on the 25th (Tue) so you can go by car to Whitianga. Whitianga is a town on the Coromandel Peninsula, in the Waikato Region of New Zealand's North Island. You've now added Stu's Wild Pig Farm to your itinerary. Kick off your visit on the 25th (Tue): identify plant and animal life at Stu's Wild Pig Farm. Keep things going the next day: tour the pleasant surroundings at Whitianga Rock Walk, stroll through Cathedral Cove Walk, then tour the pleasant surroundings at Hahei Beach Walk, and finally take in the natural beauty of Hot Water Beach. To find photos, other places to visit, where to stay, and tourist information, go to the Whitianga online trip itinerary builder . You can drive from Auckland to Whitianga in 2.5 hours. Other options are to take a shuttle; or take a bus. Expect a bit cooler evenings in Whitianga when traveling from Auckland in June, with lows around 10°C. Wrap up your sightseeing on the 27th (Thu) to allow time to travel to Hinuera. Hinuera's claim to fame is Hobbiton, the setting for the shires in the "Lord of the Rings" and "The Hobbit" trilogies by New Zealand director Peter Jackson. To see photos, ratings, maps, and more tourist information, you can read our Hinuera road trip planning site . You can do a combination of flight and taxi from Whitianga to Hinuera in 1.5 hours. Other options are to drive; or do a combination of flight and bus. June in Hinuera sees daily highs of 18°C and lows of 9°C at night. On the 27th (Thu), you'll travel to Rotorua. Your day-by-day itinerary now includes Okere Falls Track. Kick off your visit on the 27th (Thu): stroll through Rimu Walk, look for all kinds of wild species at Hamurana Springs Nature Reserve, then push the limits with an extreme tour, and finally hike along Okere Falls Track. On the next day, contemplate the geological forces at White Island Volcano and then take in the natural beauty of Hells Gate. Use Inspirock's suggestions to plan your Okere Falls trip and find the best activities and attractions for your vacation. Getting from Hinuera to Okere Falls by car takes about an hour. In June, daily temperatures in Okere Falls can reach 18°C, while at night they dip to 9°C. Finish your sightseeing early on the 29th (Sat) so you can travel to Rotorua. Skyline Rotorua has been added to your itinerary. Start off your visit on the 27th (Thu): take a memorable excursion with Hobbiton Movie Set, browse the exhibits of New Zealand Maori Arts and Crafts Institute, then identify plant and animal life at Redwoods Treewalk, and finally get a taste of local nightlife at Skyline Rotorua. 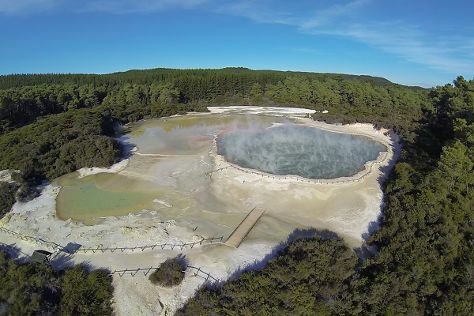 Keep things going the next day: witness a stunning natural landmark at Wai-O-Tapu Thermal Wonderland, explore and take pictures at Te Puia, then explore and take pictures at Agrodome, and finally take in the architecture and atmosphere at St Michael's Catholic Church. To see photos, other places to visit, maps, and tourist information, read our Rotorua trip builder tool . Traveling by car from Hinuera to Rotorua takes an hour. Alternatively, you can take a bus. June in Rotorua sees daily highs of 18°C and lows of 9°C at night. Finish your sightseeing early on the 29th (Sat) to allow enough time to drive to Taupo. Start off your visit on the 29th (Sat): admire the sheer force of Huka Falls, tour the pleasant surroundings at Huka Prawn Park, tour the pleasant surroundings at Huka Falls tracks, then get the adrenaline pumping with an extreme tour, then take an unforgettable tour with a helicopter tour, and finally stop by Souvenir Outlet. On the 30th (Sun), you'll have a packed day of sightseeing: take in the dramatic natural features at Craters of the Moon, then get outside with Taupo Rod & Tackle, and then admire the natural beauty at Joan Williamson Rose Garden. To see where to stay, more things to do, photos, and tourist information, read Taupo day trip site . You can drive from Rotorua to Taupo in an hour. Another option is to take a bus. Wrap up your sightseeing on the 1st (Mon) early enough to drive to Tongariro National Park. Tongariro National Park has a long history of preserving New Zealand's pristine alpine landscape. 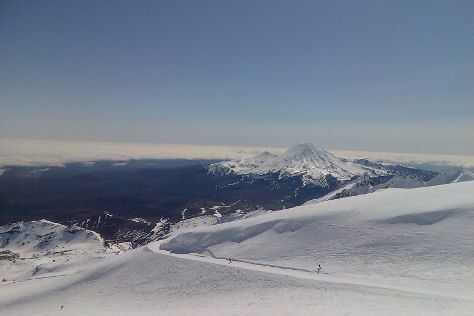 Whakapapa Ski Area - Mt Ruapehu has been added to your itinerary. Start off your visit on the 3rd (Wed): fly down the slopes at Whakapapa Ski Area - Mt Ruapehu. For ratings, where to stay, photos, and other tourist information, refer to the Tongariro National Park trip itinerary builder tool . Drive from Taupo to Tongariro National Park in 2.5 hours. Alternatively, you can do a combination of shuttle and car; or do a combination of bus and car. Finish your sightseeing early on the 3rd (Wed) to allow enough time to travel to Raetihi. Bridge to Nowhere has been added to your itinerary. Start off your visit on the 4th (Thu): explore and take pictures at Forgotten World Highway, then admire the sheer force of Raukawa Falls, then steep yourself in history at St Joseph's Church, and finally stroll through Bridge to Nowhere. To see more things to do, traveler tips, reviews, and tourist information, you can read our Raetihi trip itinerary builder app . Traveling by car from Tongariro National Park to Raetihi takes an hour. Cap off your sightseeing on the 4th (Thu) early enough to travel to New Plymouth. Where other cities run, New Plymouth prefers to stroll. Start off your visit on the 5th (Fri): take in the pleasant sights at New Plymouth Coastal Walkway, take in the exciting artwork at Govett-Brewster Art Gallery / Len Lye Centre, then tour the pleasant surroundings at Brooklands Zoo, and finally get to know the resident critters at Pukekura Park. To see traveler tips, more things to do, where to stay, and more tourist information, you can read our New Plymouth day trip tool . Traveling by car from Raetihi to New Plymouth takes 3.5 hours. Wrap up your sightseeing on the 5th (Fri) early enough to drive to Waitomo Caves. Head deep beneath the surface of the earth at Waitomo Caves, a village and cave system that draws both extreme sports enthusiasts and those wanting something a little more relaxed. 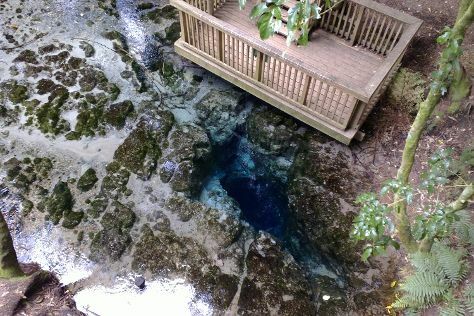 Kick off your visit on the 6th (Sat): hike along Ruakuri Walk, explore the fascinating underground world of Waitomo Glowworm Caves, Head underground at Ruakuri Cave, then look for all kinds of wild species at Otorohanga Kiwi House & Native Bird Park, and finally make a trip to Ed Hillary Walkway. To find maps, traveler tips, where to stay, and other tourist information, go to the Waitomo Caves trip itinerary builder site . You can drive from New Plymouth to Waitomo Caves in 2.5 hours. Another option is to take a bus. Finish your sightseeing early on the 7th (Sun) so you can drive to Auckland. 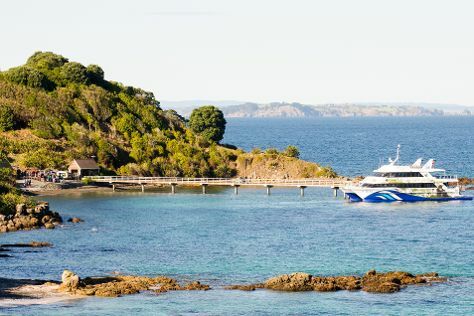 Explore Auckland further: step off the mainland to explore Waiheke Island, explore the activities along Devonport, have some family-friendly fun at Sky Screamer Reverse Bungy, and test your team's savvy at popular escape rooms. To see photos, maps, ratings, and other tourist information, use the Auckland online itinerary planner . Traveling by car from Waitomo Caves to Auckland takes 3 hours. Alternatively, you can take a bus; or take a train. Cap off your sightseeing on the 10th (Wed) early enough to travel back home.